What will you do when you encounter identity theft within your business? Chances are, you have already lost money to identity theft and business fraud. Look no further than the latest newspaper headlines to know that it is an epidemic problem and an alarming reality from which no business-whether small or large-is immune. Although you can't completely stop identity theft from happening, you can be prepared when it takes place. Investigating Identity Theft: A Guide for Businesses, Law Enforcement, and Victims is your practical guide for fully understanding and investigating identity theft. "The training that I received from Judy Collins at MSU has been instrumental to my helping victims of identity theft and locating the person(s) who caused their nightmare. I have even used the training methods she outlines in this book on a homicide investigation and it paid off: the perpetrator is now in jail for the rest of his life. I can't say enough about Dr. Collins and her knowledge of tracking criminals on the Internet; she is a great asset to law enforcement." "This valuable book is an essential, pragmatic guide for the full understanding and investigation of identity theft crimes. It also establishes Dr. Judith Collins as a foremost national expert on this growing crime problem that threatens our future." "Whether the investigator is working in the private or public sector, Dr. Collins presents valuable information on the methodology required to successfully resolve identity theft cases. The use of real-life investigations, with lessons learned, provides an intriguing and entertaining format while at the same time sharpening the investigator's skills. 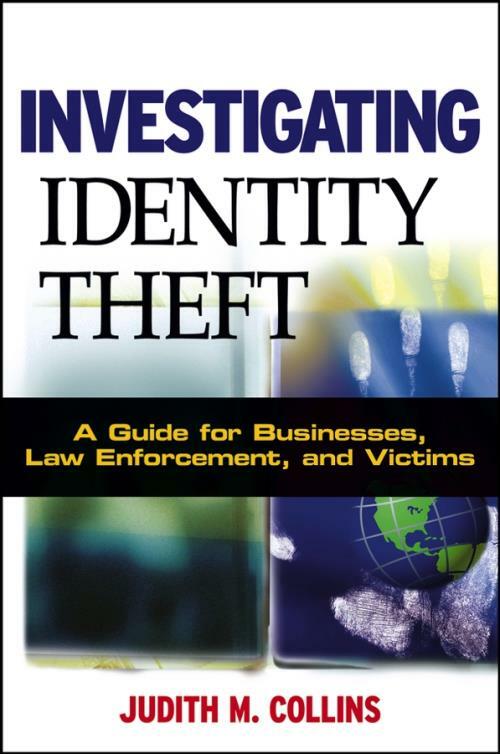 If you think investigating identity theft is not worthwhile because the crime is committed by individuals on randomly selected victims without specific objectives, goals, or purpose, you need to read this book." "An excellent book. Judith Collins has spent many years investigating identity theft. Her willingness to share her knowledge with law enforcement, businesses, and victims is truly a benefit that cannot be found elsewhere." "Well done. Smart idea. . . . This is an excellent, professionally written book . . . and much needed." "As a retired special agent with the Federal Bureau of Investigation, and having worked the past six years in the private sector, I found Dr. Collins's book to be an invaluable tool for both the private sector and the law enforcement community. Dr. Collins provides genuine insight into the complex issues surrounding identity theft. I am confident her book will assist in both the prevention of identity theft and the detection of those who prey on other's identities." - Frank Laudan, Investigator, Securitas Security Services USA, Inc.
"Excellent guide! A must-read for anyone involved in investigating identity theft! Dr. Collins has become one of the most respected and knowledgeable authorities in this relatively new field." Chapter 1. “Real World” Cases: Solved And Unsolved. Chapter 2. Know The Crime And Understand The Criminal. Chapter 3. Computer Security For Identity Fraud Investigations. Chapter 4. Configuring The Computer And Introduction To Cyber-Searching. Chapter 5. Understand The Victim: Then Prepare For The Investigation. Chapter 6. Authenticate Then Investigate. Chapter 7. Identity Fraud Investigation: A Case Example. Chapter 8. A Walk Through The World Wide Web. Chapter 9. Tracing IP Addresses And URLs Across The company website 10. Tracing E-mail Addresses. Chapter 11. searching and Seizing: The Investigator's Role. Appendix: List of Web Sites for Identity Theft Searches.